· The novel by Daša Drndić was translated from Croatian by Celia Hawkesworth and is published by Maclehose Press. · A “visionary novel about the demons of hatred that haunt Europe - and a warning that they still threaten us” – Boyd Tonkin. · Prize established by the University of Warwick to ‘address the gender imbalance in translated literature and to increase the number of international women’s voices accessible by a British and Irish readership’. Belladonna by Daša Drndić, translated from Croatian by Celia Hawkesworth and published by Maclehose Press, has been announced as the 2018 winner of the Warwick Prize for Women in Translation. Belladonna is a novel about an ageing psychologist, Andreas Ban, who looks back in anger, and irony, on the many traumas of his times, and the upheavals of Croatia and its region. The focus dwells on World War Two Croatia, whose size has made it easily overlooked by historians despite its critical geo-political role on a world stage dominated by 'great powers'. The judges described the book as: “An immensely powerful novel that breaks many of the rules in writing fiction. Part history, part (auto)biography, it is also a scrapbook of personal obsessions - lists of deportees; postage stamps; photos of unnamed people and plants - which all fuse in a furiously driven narrative. Author Daša Drndić was born in 1946 in Zagreb, in what is now Croatia, then part of the Socialist Federal Republic of Yugoslavia. She took her first degree at the University of Belgrade, Serbia, where she lived and worked for some years, and later her PhD at the University of Rijeka, Croatia, settling and living there for 25 years until her death from cancer in June of this year. Drndić’s final work, EEG, is also available in a translation by Celia Hawkesworth from Maclehose Press. Translator Celia Hawkesworth is one of the pre-eminent translators of Croatian literature, with almost 40 titles to her name, including works by Dubravka Ugrešić and Nobel Prize winner Ivo Andrić. Hawkesworth taught Serbian and Croatian language and literature at the School of Slavonic and East European Studies, University of London, from 1971 to 2002, and since retiring has devoted herself full-time to translation. She has been the recipient of the Dereta Book of the Year Award and the Heldt Prize for the best translation by a woman in Slavic studies. She has also twice been shortlisted for the Oxford Weidenfeld Translation Prize. “Anyone new to Daša Drndić should not expect an easy read – from its unconventional mix of fiction and fact to its frequently angry tone, her work is highly original. Her Croatian publisher describes reading her as being like ‘being repeatedly punched in the stomach’. “But it is not as brutal as that statement might suggest: her Guardian obituary by Amanda Hopkinson states that Daša was ‘incapable of writing a sentence that was not forceful, fierce or funny – or all three simultaneously.’ So, strong stuff, but compelling and often entertaining. “A recurrent theme of Daša’s is memory, what we remember, what we forget and often choose to forget. She reminds us frequently of the forgotten victims of Nazism, including lengthy lists of names as the only kind of tribute left to us. 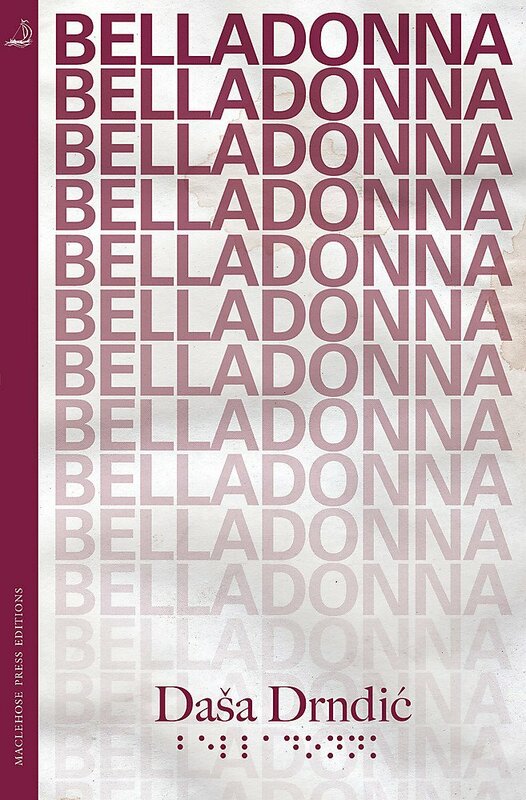 Belladonna was chosen from among six shortlisted titles that included translations from Polish, German and Korean. Man Booker International winner Flights by Olga Tocarczuk, translated by Jennifer Croft and published by Fitzcarraldo Editions, was also on the shortlist and received a special mention by the judges. The competition received a total of 53 eligible entries and 15 titles were longlisted.